The worship we share as Presbyterians is deeply Biblical, led from the communion table in the Calvinist Tradition. Presbyterian worship emerged from the Reformed Tradition of the Protestant Reformation. The flow of worship in a typical Presbyterian worship service, whether it is traditional or contemporary in style, includes praise, confession, the word in Scripture and sermon, prayers of intercession and supplication, and our response in announcements, offering, and blessing. At Lakeside Presbyterian Church we worship each Sunday at 8:30 and 11:00 a.m. in the church sanctuary. Each of these services is essentially the same; although the later service features a children’s sermon and anthem not offered at 8:30 a.m. We celebrate communion on the first Sunday each month and at special times of the year. We celebrate baptism when requested by an adult desiring to be baptized, or by the parents of a child or children who seek to have their children baptized. We welcome visitors to our worship services! Our worship is interactive and all are invited to become involved in the prayers, hymns, and more thoughtful parts of each service. During most worship services we offer childcare for our youngest folks, and invite children from grade one and up to attend the worship with their families. 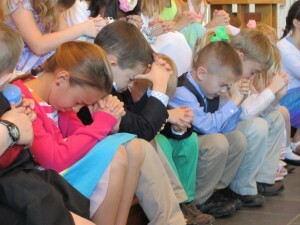 We believe in helping children to grow in understanding the worship traditions we value. Church School classes are offered between the services on Sundays in order to allow everyone to attend worship, and to provide an educational program on a Sunday morning!